Lamb Rump with Lemon Rub, Sundried Tomato Chutney, Garlic Roasted Sweet Potatoes and a Red Wine Reduction. 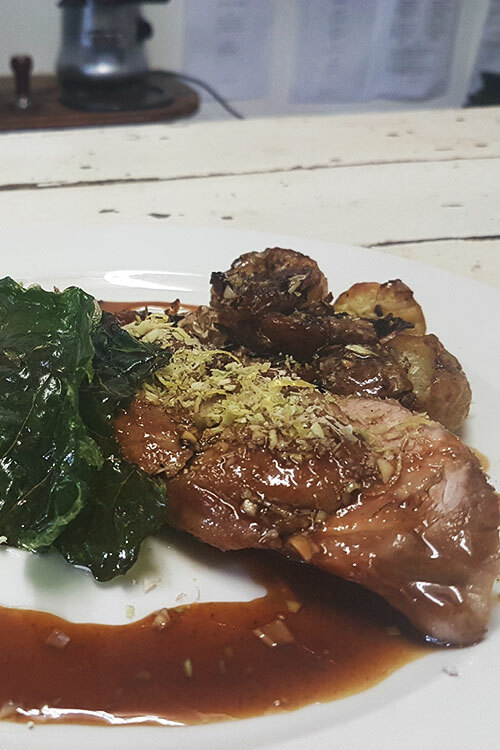 I would pair our Lamb rump with our Jean Daneel Signature Red Blend, its smooth oaky flavours complements the hearty flavours that come with lamb and the tannin in the red helps break down the fattiness from the dish. Start with Frying the sweet potatoes in the pan until Golden, since you have diced them, they won’t take long. Put them in a dish & set aside. Still in the hot pan, fry the Aubergine in olive oil stirring so they brown on all sides, when browned,add 1 clove of the finely chopped garlic and don’t worry that the aubergines drink up all the oil as they will release it into the dish when everything is mixed together later. Set aside, then fry up the Onion add the Peppers till they are soft, throw in the olives & Capers if using and set aside in the bowl with the aubergine. Next, fry the courgettes until golden, add your last clove of garlic stir in for a minute or so and add this to your roasted sweet potatoes & Aubergine mix. Toss everything through together, check the seasoning and add a good pinch of chopped parsley to garnish. I love a bit of chilli, so this is where I drizzle my delicious chilli oil over. The red wine reduction is a beef stock that has been reduced to a glaze, there are many ways of doing it, but this is our way and we find it works best here. I’ve tried to make the recipe smaller for house use. Roast bones in oven at about 220, for 30 mins or until nice and brown with crispy bits, remove fromroasting pan, keep about 2 spoons of the fat that has accumulated. Use the saved fat and place in large cooking pot on stove. Heat up and add all the veg besides garlic, fry off in pot until it starts to caramelize, don’t burn anything. Add bones and the rest of ingredientsand cover with water. Bring to boil and down to simmer. Simmer for about 6-8 hours. All the while skim off what accumulates at top. This will keep your stock clean. Scrap off what has accumulated at the top, your sauce should be very jelly like. Bring to boil, reduce to simmer and reduce by half, 2 hours. Add red wine to pan, reduce till thick, and some of your stock. There you should have a thick hearty sauce. And grated lemon and orange skin, and chopped rosemary. Some pepper, salt and sugar. Depending on your oven, the potatoes can take about 20-30 mins to roast up nice and crispy, and depending on how thick your lamb is, how long it will take to cook. We cook our lamb till medium, so anything around 8 mins. Boil potatoes in salted water until a knife can just go to the middle of the potato. Take out and squash, so it bursts open. Season lamb and place fat side down in pan add some butter and olive oil for good measure, and allow the fat to render and become crispy, seal each side nice and brown. Take a look at potatoes, give the pan a few shakes, and add any of the fat from the pan with the lamb to the potatoes pan. Every 5 mins or so, give your potatoes a nice toss in the fat that’s in the pan.